I’m 35, and my husband is 40. We have been married 4.5 years. We have four pets, five siblings and nine nieces and nephews between us. We are currently on the fence about whether to have kids and are aiming to decide within the next 6 months. We live in an urban center of a major Texas city. I’m a Vice President / Private Banker at a small local bank. I expect to be promoted to SVP in the next year and hope to move into management in 3-5 years when my boss retires. My husband is a commercial lender (SVP) at a larger regional bank. Our total compensation for 2018 will be around $482K: $356k salary, $105K bonuses, $10k RSU, $11k 401k matches. 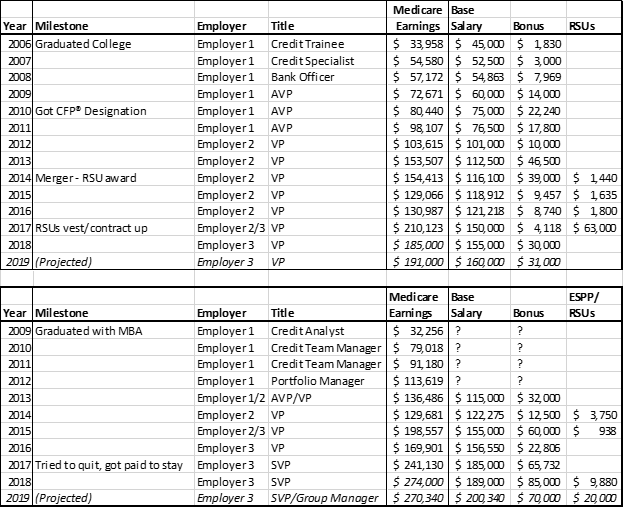 My salary is $155,000, and my annual bonus is 20% of salary. My husband’s base salary is $189,000, and his annual bonus has been around $75K the last two years; it’s based purely on his production though, so it can vary. 1. Don’t be afraid to change firms; you’ll get bigger raises and learn a lot more. 2. But stay long enough prove yourself at each employer; relationships and reputation are key. 3. Don’t ever think your job is 100% safe. Even top performers get fired sometimes because they make too much or for political reasons. I never would have left my first employer; I was given good raises and promotions, and they invested a lot in me. But I found out I was on a layoff list, despite being well-liked and exceeding my goals consistently. My position was being eliminated, to the huge disappointment of my boss who was nice enough to spill the beans to me 6 weeks early (only two others shared my exact HR title, and they were in another state but needed to be fired; to make it a Reduction in Force they eliminated the position). I called the manager at a competitor who’d been recruiting me before I’d even left the parking lot after that meeting. Long story short, I had a job before I was actually fired. I got what I brazenly asked for: a base salary raise of over 30%. I ended up really liking my new office, manager and company too. That was a huge lesson: there are many places I can be happy. I was scared since the new position would be 100% business development, but things worked out. We grew fast and got bought (the owners’ goal), and I signed a contract to stay with the new owner in exchange for some RSUs. By the time I was ready to move on, I once again was able to ask for what I wanted; I got a 24% raise with that move. Our income spiked more than average with each transition due to the reputations and relationships we built (being recruited in a hot market helps). We’ve also learned a lot by working at banks of different sizes, credit standards and cultures. We are better connected too, having worked with a wider variety of colleagues and clients. I feel much more confident today in my ability to adapt and thrive in a variety of environments. However, we’ve grown roots over 10+ years in one industry and in one city/market, which has deepened our influence and community ties despite the employer changes. I’ve seen friends’ incomes stagnate because they moved around too much early on, trying different things and effectively starting over each time. Sometimes that’s necessary due to a layoff or move, but it often seems to be due to boredom or frustration with just one or two years of income stagnation. Moving for an extra $5k or $8k may seem worth it financially when you’re making $50-$75k, but it may not be if you’re moving laterally and giving up the opportunity to command 20%+ if you land a few more clients or get that promotion first. Whatever your field, becoming an expert and plugging in to the network takes many years; but around year 7 – 10 the snowball picks up momentum and those early efforts start to pay dividends. The irony is that many people quit just when that momentum builds; that’s the point when many folks are financially stable enough to decide to FIRE or stay home with kids or try that dream career that doesn’t pay much. You’re giving up an incredible amount of future earning potential to make that choice to sacrifice the network and expertise you just spent 10-20 years building. If you do stay with one employer, know that you could get bigger raises by moving and negotiate accordingly. Your manager would rather push for higher pay for you than endure the hassle and expense of recruiting your replacement, but he or she probably won’t do it proactively. You can push the issue casually and even with humor in many cases if you develop a good relationship with your manager. Banking is a great career path for work/life balance as well as the possibility of high pay. We make nearly as much as many attorney and physician friends now that we are 10+ years in, but we work roughly half the hours. Even the most dedicated hustlers in banking rarely work more than 50 hours a week (including golf tournaments, charity parties, etc.). I am at a smaller, less sales-focused firm and work 8:45am to 5pm. I often go to the gym or home for lunch and never work weekends, though I do frequently attend evening charity events or networking happy hours. My husband has a more sales-centric production role. He works 8:30am to 5:30pm most days and a few hours on the occasional weekend when he’s slammed. My mother gave me and my siblings the maximum annual gift tax exclusion amount this year, and she plans to continue that. In 2018, any individual can give another individual $15,000 without paying gift taxes or filing a gift tax return. We also each get a few hundred bucks for various holidays from parents and grandparents. I started buying rentals in my early 20’s, and I accumulated 10 units in five years. I’d read a few books on how easy getting rich with real estate was, and I wanted the option to stay home with kids eventually while still contributing to my family financially (I decided this at 22; I was always an over-planner). I imagined myself jetting around town in a luxury SUV with a toddler or two in tow, handling maintenance and showing vacant units. The reality was not glamourous. I was too trusting; I paid full retail price for two duplexes in 2008; and I knew nothing about home maintenance. Unsurprisingly, I didn’t cash flow at all for the first few years and dealt with tons of tenant drama. Still naïve/idealistic, I bought two more duplexes in 2010 (my initial plan was one property per year). As lucky market timing would have it, I got those at a great price. The equity started building ever so slowly, and I learned a lot (mostly the hard way): negotiation and confrontation, eviction law and building codes, the layout of my local Home Depot. I added a condo in my neighborhood in 2012 and finally hired a property manager. I figured the extra cost would be worth time saved, but my overall cash flow actually improved. Maintenance/repair costs plummeted due to their scale and bargaining power, plus they enforce late fees and eviction policies. I sold my two worst performing properties in 2016/2017 (though both had appreciated well), so cash flow is now firmly positive. 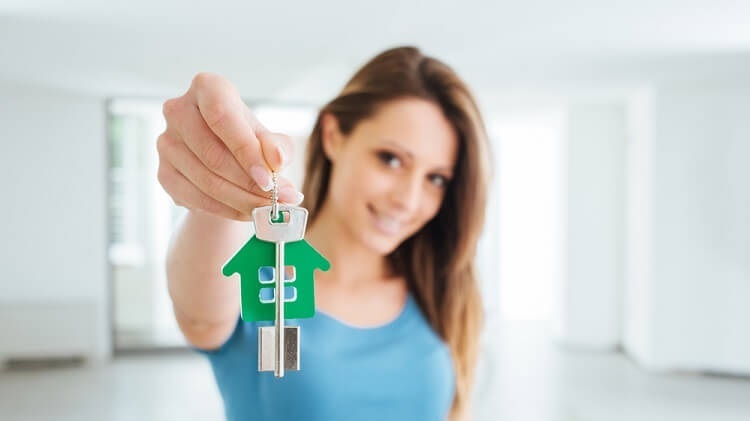 I haven’t bought another rental since meeting my husband, but we’ve invested in real estate investments through syndicated deals since we became accredited investors with marriage. We own 1-2% of several apartment buildings. We don’t have any hassle, but we don’t have control either. I worry about the unpredictable large capital gains we’ll have now that we have 7 of these projects with 3 different investment groups. We’ve let lifestyle inflation run a little rampant lately. Our average annual spending over the last three years has been $159k according to Mint (not including payroll expenses). Here are our three-year average spending figures (from Mint, plus I added payroll deductions). I’ve tracked spending carefully via Mint for about a decade now. DH used Mint too, and I added all his accounts to my login when we got married so I can see and track it all (he could too but rarely logs in – which actually works out great haha). We don’t have a budget; we both max out retirement and then spend what we want and then save what’s left in cash until a market drop or RE opportunity arises. If net worth is trending up and our savings rate is high, I don’t worry about spending. We’re careful to keep fixed costs low so that we have a lot of flexibility to save or spend how we choose though. For example, he has discouraged me from upgrading my 2011 basic car, and I talked him out of joining a golf club last year. As far as implementation, I’m a big believer in combining finances – even considering I brought in nearly 10x his net worth to our marriage and also earned more money when we dated. We both feel that legal marriage is good for two things: building a family and building wealth. The friends we have who try to keep things separate end up engaging in competitive spending, have more resentment and arguments, and end up in no win situations like debating who gets the tax refund and whether somebody’s bikini wax or holiday decorations are a personal or joint expense. When we got engaged we opened a joint account and contributed 50/50 to it for joint expenses (new house and furniture, vacations, dates). When we married we closed our individual checking accounts and attached all income and expenses to the joint account. We still have our own credit cards for personal spending, and we can take cash out for things like gifts. But we are both focused on growing joint net worth. I want to add for folks who may be in a similar situation that we did talk about getting a prenup but we couldn’t figure out what we’d want it to say. There are just too many variables – what we will both earn over time, whether and how many kids we’ll have, etc. My rentals are in an LLC, and they remain separate property (in TX, a community property state, capital gains on separate property stay separate – but that’s not always the case). The rental income is legally community, but he’s made more than me the last few years anyway, so I’m OK with that. And I honestly don’t think he’d ever fight me for those, given I bought them many years before we married. I’ve comingled most of my separate property though, legally speaking, in order to invest in these Re syndications and for other reasons. The only way to avoid it is to set up trusts and really watch every dollar of distributions and reinvestment. People get hung up on what the law is, but the reality is that if you can reach an agreement or go through mediation, a judge will never have to divide your assets. I keep careful records, which I hope I’ll never need. We both believed, based on our savings rate and habits, that within a few years of marriage we’d be much richer together than we’d be staying single. So far that’s proven to be true. I had a net worth of around $1M when I got married, and his was just over $100K; 4.5 years later our joint net worth is $2.7M and growing at $400K+ a year. Even if we split it in half (meaning I give him some of my separate property), we’d both come out ahead. I don’t think this will happen, but it’s a meaningful thought exercise for those considering marriage to someone with a very different financial situation. Not to mention that we’re both enjoying a nicer home than we’d have purchased as single people, and other lifestyle enhancements. We save around 50% of gross income. This may seem like a weird way to calculate it, but I don’t think you should get savings accolades for financing a home over 30 years versus 15, for example. Arguably all the mortgage and car loan payments should be classified as “spending” though – not extra savings. There are many ways to consider this. I did classify our extra payments on DH’s student loans as spending on education in Mint – not on “debt repayment” or “savings” which sounds better but is kind of a farce. Then again retirement savings are also just deferred spending accounts, as are vacation savings accounts and 529 plans. So it’s all a bit wishy washy depending on your point of view. Theoretically at least, it’s all meant to be spent sooner or later. We’ve maxed out retirement accounts since getting married, but that was all we did at first while we focused on buying and improving our home, paying off DH’s student loan, and paying extra on our house (until we finally refinanced to a 15-year fixed). We bulked up brokerage and moved a lot into RE deals with after tax savings and the rental sales over the last two years. Now any excess is mainly piling up in cash. As you can see, we are not exactly frugal. DH loves golf, and I like going out and shopping on foot in our neighborhood – which means paying more at trendy restaurants and Whole Foods rather than driving to cheaper bars or Costco. He treated himself to a new entertainment system for his 40th birthday, and we’ve both splurged on some work attire upgrades as well (custom jackets, designer shoes). And we do like to travel. This question has gotten tough for me. Because we don’t have any specific goals currently, we don’t really have a plan or an IPS that we stick to. Our asset allocation outside of our homestead and $50K in cash reserves is currently 2% cash, 4% bonds, 55% real estate, and 35% stock (27% of which is international) plus 3% alternatives. I don’t see the use of bonds in our accumulation phase, especially since RE can act as a fixed income substitute. But as the market has increased I’ve shifted some stocks to bonds mainly in preparation for a buying opportunity. It’s hard to know what to do with new cash and with proceeds from RE sales. As prices have risen, I hesitate to simply 1031 all the gains into new projects. It’s a bit annoying that these guys never want to buy and hold; they’d rather flip these deals and go on to the next project every couple of years (which is of course how they’re best paid). Part of me is debating accumulating cash and just buying our own multifamily property. I could even raise funds from friends and family and do my own syndication. I’ve always been a fan of index funds, which is where the bulk of our investible assets are. However, we also own Vanguard’s Wellington and a China fund that’s offered in my 401k plan that otherwise has a $100k minimum. We put our clients’ money there as well, and the managers are known by our firm personally. I think in certain markets (fixed income, emerging markets), active investing can have a place and can outperform passive strategies over time. One of our real estate syndications. We invested $25,000 in 2016, and the principals gutted half the units and made some exterior enhancements and leased it back up. They got a crazy offer and sold it ahead of schedule after only 11 months (plan is usually to stabilize over years 2-3 then refi or sell). We doubled our money almost exactly in less than a year, though we rolled the proceeds to a new project via a 1031 exchange to avoid paying short term capital gains taxes. I had a Prosper account for years and am pretty sure I lost money overall – they made calculating your actual return impossible though so who knows. I wonder about this sometimes, but none of my aggregators (Mint, PC) seem to be able to figure it out, and there’s no way I have time or capacity to use Excel to try to track it, even as obsessive as I am. Most of our equities mimic the overall stock market return. My first home, a condo, appreciated 3.7% a year during the years I owned it (2006-2016). The ROI on rental cash invested is 13.9%, undetermined (put 0% down), 33.7%, and 35.1%. The capital gains on my rentals have averaged 1.3%, 6.4%, 6.7%, 6.2% over 4-10 years. I sold my first rental for $245K last year; I paid $130k in 2008 but had to put $30k of plumbing work into it the year I sold it after the pipes all corroded simultaneously. Total return including cap gains and cash flow were 8.2% annualized per year. The RE syndications have seemed to average 22% with one group over the last 3 years; one we did with a much more conservative group distributes about 4% and is projected to have an overall IRR of 8-9% over 7-10 years. The tech accelerator may well be a total loss. You never know though; a few companies have meaningful revenue and are growing. Almost daily except on weekends and vacations. I had a huge head start. I’m very grateful for this financial assistance, but I’m also proud that I have protected and grown those funds. I have maxed out a Roth IRA at Vanguard since I turned 18 and got my first job; today the balance is $215K (7.6% annualized return over the last 10 years – not sure why Vanguard won’t let me go further back). 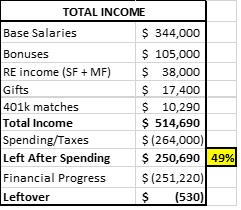 I always contributed to my 401k, starting at 6% when I got my first full time job at 22 and moving steadily up with each raise until maxing it out at age 29 or 30. My 401k balance today is $265K (it’s been rolled from employer to employer). DH had $40k liquid and about $150k in retirement when we got married, along with a $70k student loan balance from getting his MBA. He did not have any help financially from his family. I think saving was my greatest strength over the last 10 years, but I think over the next 10 it will be earning. I’ve always loved watching the balances on my net worth spreadsheet grow – and I’ve been tallying that up monthly since I was 20. I saw my first compound interest chart at 13 and was riveted. I’ll probably be one of those people who will never be comfortable watching my portfolio dwindle in retirement. I never thought of myself as a higher earner though. I remember a mentor a few years my senior at work scoffing when I told him I made Roth 401k contributions. I was in my mid 20s earning about $55k, and I explained that due to my tax bracket it made sense. He laughed and said my tax bracket would soon rise and change that; I still remember my confusion and not believing him. But he was right. I’m a little too eager to gamble/invest in anything that comes my way. I dove into rental real estate impulsively after a breakup, buying one of the first properties I looked at (though I’d read books on the subject for years). I eagerly poured money into peer to peer lending when that first came out. When I became an accredited investor, I jumped at the first private equity deal that came my way, one of those RE syndications. And when my husband happened to know the founder of that tech startup accelerator, we drained our savings to meet the minimum investment in that soon after. Luckily DH put his foot down when I wanted to invest in Bitcoin at around $16000. I get real investing FOMO. Which, I reason, is better than spending money on designer cars and clothes (though I’m having to fight that urge lately too). Granted, I’ve always done the more mainstream/boring “right things” as far as contributing to retirement accounts and using index funds and buying a home too. And the willingness to just dive in can be beneficial as opposed to “analysis paralysis” that can keep investors on the sidelines for years. But I’m realizing there are endless opportunities and that I really need to pause and analyze carefully –it’s OK if the timing isn’t right for us for a particular deal. There will always be another one. Our net worth is growing at $300k a year not including any market growth: $92k retirement contributions, $42k loan amortization, $165k taxable savings. We plan to keep this contribution level (or increase it if our income rises further) and continue to invest primarily in real estate and stocks over time. Not really, though lately I’ve been thinking that $10,000,000 is a nice even number to shoot for as a married couple; that way even in a divorce we’d both be financially free. Of course, we don’t *need* that much, especially if we don’t have kids. But in that case we are even more likely to hit the target. And due to inflation, $10MM when I’m retirement age will feel more like $5MM today so it’s not as unreasonable a goal as it may seem. My net worth hit $1 million when I was 30 and got married. Technically I was nearly there on my own, depending on the actual value of my rentals. But when we combined assets, our joint net worth jumped to over $1.1 million. My behavior didn’t change then, but it’s changed in the last year or so as our family and retirement goals have shifted and as our income has spiked. With the possibility of FIRE within reach, I’ve realized that extreme early retirement isn’t something I really want. I don’t even think I’d want to stay home with kids if we decide to have them (though I’ve seen enough women go through this to know you truly never know what you’ll want). With no big financial goals and lots of free cash flow each month, I’ve consciously loosened the purse strings and invited some lifestyle inflation. I still save coupons and maximize credit card rewards and buy what’s on sale at the grocery store. But I no longer analyze the lifetime retirement savings impact of decisions like taking my dogs to the groomer each month or employing a housekeeper. I even tried (unsuccessfully) to lobby DH to spring for first class tickets to Europe this year – a PF blogosphere sin for sure! I feel like we COULD live off what we’ve got now if we had to. So anything more is a bonus that can be treated as such. I bought a brand-new Audi coupe for around $50,000 when I got my first big bonus in my late 20s. It was cheaper than the used version of the model I preferred, so I decided on the spot that it made sense. I was uncomfortable and self-conscious in it from the start. Valets expected huge tips, I could see people constantly rolling their eyes at me (I was a 20-something blonde after all), and cops and security guards started giving me extra attention. I was accosted multiple times by strangers (all guys) gushing and telling me it was their dream car. I didn’t know or care anything about cars! To this day I can’t tell you what kind of engine that car had. And the low ride gave me knee and back pain climbing in and out with heels on. I ended up totaling it 6 months later (turns out I can’t handle that kind of engine), and I happily used the insurance check to buy a very used non-performance SUV – and to put 20% down on a rental property. I learned that status symbols – especially those you don’t personally value – are NOT worth the money. That rental (the 2012 condo) hasn’t cash flowed much but has increased in value over 6% a year since I bought it. Create a job/life you want now so you’re not waiting to change it. I finally stumbled into a life I actually like, and now striving for early retirement isn’t a pressing concern. It’s a huge mind shift. With that I’m on track to build real wealth that can change my kids’ or other family members lives forever, or really impact my community. Aiming to accumulate just enough to sustain me for the length of my natural life and then retiring in my prime years to begin decumulation strikes me as a key example of thinking small. Read lots of books (and blogs). Just get started. I made lots of mistakes in the early years – trading individual stocks too frequently, buying real estate (and maintaining it) at retail price, mistaking gambling for investing, violating wash sale rules. But the earlier you try things and learn from those activities, the sooner you figure out what works for you and set about building wealth that works for you. I am comfortable with my lifestyle now; my focus is on saving enough to support it indefinitely, whether or not I continue to work. If my life changes (kids, divorce, death, disability) then my lifestyle may change as well (new home, different spending needs). If we remain DINKs though, I imagine that we’ll accumulate enough wealth to increase our lifestyle more over time and/or retire early. I’d like to be able to take my nieces on fun fancy trips annually and perhaps help pay for my nephews’ educations on DH’s side. I used to imagine retiring at 40 with about $3 – $4 million, but I didn’t have a firm grasp of what I’d want to do next. But I’ve recently realized I could work in my current job indefinitely while still doing things like traveling, writing, volunteering. I really like my team and company – plus I’ve witnessed lots of retirees get part time work (often very low paying) just for the social interaction and mental stimulation. My parents are retired and financially comfortable, but my dad talks about getting a job at a bookstore or Starbucks, and my mom spends 15+ hours a week teaching online for less than a hundred bucks a week after taxes. I’ll never be able to relax and do nothing for very long; I get antsy and in my head just over a long weekends sometimes. I’d inevitably launch a second career or business – why not stick with the one I’ve already built? In short, there is nothing pulling or pushing me toward retirement at the moment. Kids could change that, but several of my sisters and friends have been surprised at how much more they treasure their careers after becoming moms, and I bet I’d be in a similar boat. So weirdly, I don’t plan to retire at all currently. But I’m 35. What do I know? Of course I want the option. I plan to build enough wealth before retiring that I won’t have to worry about anything other than black swan events that I can’t do anything about (Great Depression II, World War III, etc.). I was 13 years old, trapped on a four-hour road trip in the back of my grandfather’s Lincoln Town Car, and I found a Motley Fool investing book. With nothing else to do (this was the mid 90s), I read it cover to cover. They had one of those compound interest charts where two twins invest differently: one brother at 25 saved $3k a year for 10 years; the other brother at 35 saved $3k a year for 30 years. Both retire at 65 but the first brother has like a million more dollars. I was enthralled, and I later searched in vain for a similar chart showing what could happen if you started at 15 or 20 instead of at 25. It seemed like magic, and I was easily convinced (see above weakness for gambling/easy money). My father had always made going to the bank a big deal, and I’d had my own savings account from age 8 or so. When I told him I needed a “discount brokerage account,” per the book’s instructions, he laughed but encouraged me to open a Scottrade account online. He made me figure it out and pick my stock holdings, and the next year he made me file a tax return too even though legally I didn’t make enough to have to. I remember using the Foolish Four Investment principals – I bought MMM, DIS, GM, and something else I can’t recall. I think he also matched my early savings to get me a few thousand to invest. I was hooked, and I devoured any financial information I encountered from then on. At age 18 I opened a Roth IRA at Vanguard and started maxing it out (luckily I heard about index funds from my grandfather; he was an early adopter), and in my 20s I hopped on the RE bandwagon. I’ve never been the best investor, but almost anything works if you buy and hold. My grandfathers were both always my heroes. I know it sounds like a cliché, but they were both larger than life, well respected in their communities and successful entrepreneurs. Both started out in poverty but built successful businesses. My grandmothers helped run those companies and raise many children, and I look up to them as well. I’ve always felt a tug toward self-employment as a result – or as a genetic disposition. My father also did well for himself and vacillated between well-paid corporate jobs and entrepreneurial / FIRE interests, mainly with an eye on improving his community. I’m very like him emotionally and therefore wary of the freedom and lack of structure that financial freedom can bring. He has kids and grandkids to add meaning and purpose to his money and time, but if I don’t procreate I won’t even have that. My mom was a product of her time and married a great guy and had four kids quickly. She got a masters in Math and launched a career in her 40s after being a SAHM for 10+ years and beating stage 4 breast cancer. She always tells me I don’t have to have kids, and part of me suspects she’d like to live a child-free life vicariously through my experience (though she loves her many grandkids that my other siblings are providing). DH gives 2% of his salary to United Way which is encouraged by his employer. We give a few more percentages of income to various charities on an ad hoc basis as well. I don’t volunteer much anymore, but I’ve sat on a couple of boards in the past and was a member of Junior League in my 20s. I used to target 10% of income for giving, but when we got married DH wasn’t comfortable with that much. He still had student loan debt and was just getting used to a higher income, so he didn’t feel financially stable enough to focus on giving. Our situation has changed, but we have some misgivings about how best to allocate funds and whether many charities use resources well or make much of a difference at the end of the day. One thing we did a couple of years ago is invest $50K in a tech startup accelerator. This isn’t charity, but we view it as effectively a donation to support local entrepreneurs who are creating jobs and trying to build something and solve problems. There’s a chance one of the startups gets sold to Google, but there’s a chance they will all fail and we will lose the money. There’s another fund that focuses on healthcare startups that we may invest in (donate to) next year. We are in the process of setting up a will, and the current plan is to leave everything to each other. If we both die together, we’d leave everything to our siblings (with $10k or so going to our pet sitter with our pets). Which assets go to whom is up in the air. We don’t want them to have to figure it out, but we also don’t really care at the end of the day and separate property is getting very difficult to track. It may be easier to just say 50% to his and 50% to my siblings (even though more than half our assets are technically my separate property). I’ve also suggested that we each may want to leave something to our siblings if only one of us passes; we may change the primary beneficiaries on our 401ks to be our siblings, for example. Obviously if we have our own kids this will change. Your rentals have 30 year mortgages while in an LLC. Did you just quit-claim deed them? Yep. It wasn’t a problem, though I was prepared for the possibility of a nasty letter and being forced to move them back into my name. When your mortgage company escrows taxes and insurance in particular, they might have the system set up to flag it when the name on the tax invoice doesn’t match the borrower name in their files – or so I’ve heard. But even though I escrow, neither of my two major lenders ever caught wind of it or bothered to contact me about it. Thank you for the extraordinary level of detail and congrats on your achievement. I have no doubt that you will reach the $10mm mark at some point. Your story is a perfect illustration of a number of themes I have noted with young millionaires: (1) Start early, (2) Figure out what works best for you (one size does always not fit all), (3) Don’t dwell on losses other than making sure you learn from them, (4) Think through potential issues and plan for the worse (that’s not being pessimistic its being realistic), (5) Rigorously manage whatever headstart you’ve got whether its a little or a lot, & (5) Carefully consider the marriage decision (cause if you get it wrong its often a death blow). You clearly had a “huge head start” as you put it, with nearly half a million dollars in gifts from family. Nothing wrong with that, as you’ve managed and grown it extraordinary well where many others would have squandered it. I am admittedly envious of both the $$$ and also what looks like a very supportive extended family. I had neither of those starting out which in some ways gives me a keen hindsight appreciation for the benefits and safety net that would have provided. I can assure you and others that the stress and sacrifice of building multi-mil wealth from zero is not necessarily a more noble endeavor – it’s just a much harder one. I can identify with many of the other aspects of your situation: I too am a big fan of r.e. and have spent time in finance as well, though unfortunately not on the “bankers hours” you described. If I were lot smarter I would have moved to a low cost part of the country, hitched onto a regional bank and taken a more leisurely pace instead of the crazy hours, shark-infested, big city rat race I started out in. To each his/her own path… but I am really liking yours! Looks like you and your spouse are really growing the NW by leaps and bounds right now. I too have experienced accumulation periods where NW just seemed on fire. Now days, at upper seven figures (aiming for eight) and a bit of grey hair it seems a bit more like watching grass grow (i.e. the growth feels like it has slowed somewhat) but I think that is partly an illusion of numbers – a hedonic adaptation of sorts. In other words, it takes ever bigger numbers to get excited about it. Like you, I just don’t really want to slow down too much. I can’t see not using all of the skills, talents, networks that I’ve built over the last 30 years just being put out to pasture. Not sure exactly what’s next – but I do need to at least slow down the treadmill. Still, its real nice to have options. “It’s real nice to have options.” Exactly! I may eventually want to slow down or dramatically change course, and it could happen overnight for any number of reasons. Having options has always been my real goal and focus. However I’ve started to realize that attitude can also be a procrastination technique and can cause anxiety for me personally. Wanting options and flexibility above all can make it hard to commit to a path, be it a location or job/career or family. Love your overall philosophy around work and retirement, probably because it is in line with my own thinking. I have always believed the focus should be much more on FI than RE. People love to glamorize the RE part but it comes with many more challenges and pitfalls than people might imagine, especially when you have no control over life’s extenuating circumstances that can wreak havoc on well laid plans, no matter how well thought out. I also like that you freely spend based on what makes you happy and you are not mired down with a frugal mentality. There is room in the world for both philosophies and one size does not fit all. Good luck with your decision on having kids. I married late, (35) and had our one and only daughter just one month short of turning 41. She is a college sophomore now and has been a blessing to us since her birth. Raising her was manageable, with both my wife and I continuing to follow vibrant and challenging careers. If managed well, you really can have it all without making too many sacrifices. Thank you for an engaging and detailed interview. I wish you all the best in life, health and wealth! I completely identify with the focus on FI rather than RE. I guess it all depends on personal priorities – some people just really don’t want to spend their lives working. I don’t mean that in a “lazy bum” kind of way, I mean it as the career, job, daily slog, whatever is just a means to an end, not particularly fulfilling. And also sometimes aging and health issues just make it harder to keep up after awhile. Like MI-105 when I was 35, I never really thought I’d want to retire. I wanted to be wealthy but did not envision myself not working, maybe just working differently. Now over 50, I can see that probably somewhere around 65 I’ll probably really not want any significant work obligations, but we’ll see. I also don’t feel financially prepared for retirement, despite an upper end NW. I know, I know, I know… that is a complete illusion, but I grew up with a lot of financial instability and in proximity to serious poverty, and so it is ingrained in me. My dear wife says I will never feel completely secure enough to let go. I also just don’t like the idea of draining down what I’ve worked so hard to build up. And I would like to leave a substantial amount to charity – A handful of charities are earmarked for $1mm bequests in our estate plan and I feel really good about that. Even if I had kids at least half my estate would still go to charity once they became adults – I would want to help them earlier while I was alive, not later when it matters less. Anyhow, I really enjoy working though it can be exhausting. Now with the NW built up, I have more ability to dictate the terms of working rather than being a slave to work. Still, getting the work-life balance thing right is tough if you want to continue making a high income. But, as I said before, its real nice to have options. And I’m a lot less stressed about the future before my NW got to where it is now. Hi Miguel, I think you and I are also kindred spirits. I left the corporate world about 3.5 years ago and helped start a healthcare technology and services business from scratch with some former peers from my corporate life. I am now 61 and we are in the process of raising our Series A to fund the growth of our company now that we have a proven concept and paying customers. It has been an amazing learning experience but certainly not for the faint of heart. I’ve also been approached recently with an opportunity to jump back into an executive role with another more established firm. I’m going to interview and just see where it goes. The nice thing about being FI at my age is I have the full freedom to do whatever I want and take risks that make sense. Since I was 35, I have operated on a 5-year plan where I re-evaluate where we are every five years and then make a new 5-year plan. My next evaluation is in 4 years when I turn 65. By then I will know whether it is time to call it a career or maybe soldier on for a few more years. My wife is 4 years younger and a real go-getter so a lot depends on where her head and motivation are at that point. I’ve enjoyed the twists and turns we’ve gone through and look forward to seeing how it all ends and where real retirement takes us. Like you, I want to continue to add to the NW, not because I have a goal to strive for as much as I just think the more cushion you have the less you have to worry about when the payroll checks eventually do stop coming. The truth is, based on where we are now, I probably should not be worried at all but something in my nature keeps me always a little on edge. Good luck to you and may you also find your comfort point and enjoy whatever else life brings your way! Arhgggg… can’t seem to type straight today: I’m a lot less stressed about the future, THAN before my NW got to where it is now. This is probably one of the best interviews I’ve read here. I probably feel that way because I have followed a very similar path. Fanatastic. Lots of thoughts but quickly – I’ve noticed that you guys have had great luck in different aspects of real estate. As W-2 employees, it’s a great compliment to that earned income income at tax time. My question is – do you intend to go forward with a continued focus on building your real estate portfolio ? Given the fact that you two probably pay a huge amount of taxes in your corporate jobs, your biggest challenge may be tax management. Also, while you live in a red hot real estate area, you seem to understand that space very well. Maybe go out of state ? Your market is probably near top – I get that. The thing that stands out to me here is that you guys understand how money works – obviously. Your diversification seems near perfect. Read – damn safe. As a guy who takes place in the market – only about $50k per year to fund my SEP, I’m still very leery of it. “ Tax deferral” means “ pay eventually” and frankly I don’t expect my tax rate to drop after “ retirement”- which I probably will never do. Just curious because you guys have put yourself in a great place with options at a very young age. Also – would your mom like to fund my next real estate transaction ? Great rate ! Thank you! And ha, I do feel a bit bad about the low rate I’m paying my mom now that rates have risen; though it’s still more than she’s earning on many of her bonds. We are honestly at a big turning point with regard to real estate. I found out this week that the investors who manage the real estate syndications we’ve poured money into over the last few years are getting out of the business (they are doing an institutional fund now with much higher minimums that we’d be comfortable with). So not only will three of our deals sell in the next 9 months, they won’t be lining up 1031 opportunities and we won’t have new syndication options without developing some new relationships. On top of that, DH declined to participate in his deferred comp plan for 2019. So we’ll have a lot of cash to figure out what to do with (great problem to have). Direct RE purchases are an option, or we can dump it in the market (possibly during a downturn), or we can repay cheap debt (not very appealing). TBD…but yes I agree buying more RE makes a lot of sense one way or another, particularly as we’ll be bumping into the 35% tax bracket next year. I have a somewhat similar “problem” in that have substantial level of cash right now was planning to make a r.e. purchase, but put off until now for various reasons. So now its same decision matrix: (1) R.E. purchase but valuations seem high, (2) Equities but really don’t want to unless there is a big correction, or (3) Repay debt but am borrowing at very low avg 3.5% next few years, plus if I then see that r.e. oppty there will be added fees & higher rates to re-borrow. By the way, any good book/web references for learning more about 1031 exchanges? No, I really don’t. I learned about their rules in prepping for my CFP exam but also mainly in practice going through one. Honestly though I didn’t have to arrange the mechanics of the exchange, so I wouldn’t say I’m an expert when it comes to that (selecting a provider, etc.). And I have pretty much the exact same thought process going on about where to put new cash. Markets are softening, but prices seem high just about everywhere. Debt is historically cheap now; my 2.75% mortgage is barely above what I can get in a money market account now. Surely I can find something better to do with funds than prepay that! Enjoyed your post. If there is a way for us to connect I have a couple of contacts in Texas that put together syndications. I could probably arrange to put you in contact with them to investigate whether you would be interested in any of their deals. Great story. I absolutely love your excel tables. A like minded person. I also had similar tables in my MI-94 interview. Great you got a head-start and went UP from there. Oftentimes an easy head-start leads to coasting. Clearly the opposite of what you did. You don’t need any financial advice, clearly you have that mastered. You spending is way higher than average, but you know that and your income keeps pace. My one suggestion – HAVE KIDS. You have no idea what you are missing. I am nearly FIRE by it would really be meaningless without the kids. Hard to explain until you have experienced it, but when you do it all clicks. One caveat is be sure you are married to the person you want to have kids with. Based on your interview you seems to be an extremely pragmatic and logical person. I noticed a few references in this interview that indicate a future divorce is not out of the question and you might even be contingency planning for it which got my attention. ie – “$10,000,000 is a nice even number to shoot for as a married couple; that way even in a divorce we’d both be financially free” Good to be realistic, rational and have the options covered, but if you think the marriage may not be around to last, then maybe no kids – but like i said – life is so much fuller with children. Hopefully someday you can find out first hand if it is the right thing for you! You won’t believe what you were missing after you do it. They are truly a blessing. On your rentals – did some quick math (in excel of course), $1.15M rental property values, subtract out loans and it looks like you have $564k in equity and cash flow of $21k which translates into 3.72% return on equity. How does that compare to performance of your index funds? I ask because I am totally in cash, index funds and a few stocks and always second guess if i should also be in rentals for diversification. Whenever I do the math, the rental option provides pretty poor returns, with lots of headaches. Low return on investment compared to funds unless i bank on making my money on increased property values over time. Thanks for the great read! enjoyed it. Your ROE calculations seem about right. However that’s mainly because of property appreciation over the last decade. I’m earning about 30% returns on the actual funds I invested: down payments + closing costs. But the ROEs are fairly low now, and I don’t expect the kind of appreciation I’ve gotten (which was more luck than anything) to continue at above average rates. And yes, they can be a headache, even with property managers. For that reason, I’m not as hung ho as I was about RE as I once was, and I don’t enthusiastically recommend it to everyone like some RE investors do. But I bought RE primarily to diversify away from the stock market as my sole source of FI. Stock market returns have happened to do really well over the last decade, and I’d probably have been about as well off with a lot less hassle if I just left my $ in the market. If we’d seen a decade of flat returns though – which has happened before and may happen again over the next 10 years – then RE starts to look way more appealing even at normal appreciation rates. And thanks for your comments about kids. I truly love getting advice on both sides. I know it’s one of those decisions that has to transcend a pro/con list. But purely from a rational perspective, the risks and work hardly seem worth the uncertain reward. From an emotional standpoint I would struggle with normal parenting anxieties, but I also fear an inability to handle a severe disability or terminal disease or drug addiction. I think even without those outlier challenges, parenting in general would take an above average toll on my marriage; neither of us is particularly patient or empathetic. And I truly think I’ll be fine and have a nice life either way. It’s a tough trigger to pull given that it’s pretty much the irreversible, massively life changing decision that it is. But I have to agree with you. FI and pretty much everything does seem relatively meaningless without family. Amazingly rational and pragmatic! I am very impressed! Certainly a big reason why you are successfully. All of life is a risk, and with it lots of opporunities for rewards. The risks that come with kids you worry about are real, but the odds are exceedingly low. In Texas, lighting strikes, floods, tornadoes are real – but you still live and enjoy your life and are happier for taking that risk. Kids are the same, there is a very very small chance things are not perfect but a much higher odds they will be AWESOME and life changing in a very positive way. Modern medicine is better than ever, making odds of your concerns even lower. Being and analyticaly engineering type i had all the same concerns. “What if something is wrong?”, “What life changes too much?”, “What if they turn out to be losers?”, “What if they don’t share my love of quicken and excel?” etc etc etc. The list of worries is endless if you choose to think about them. From my experience (and most parents I think) best thing i ever did was roll the dice and ignore all those worries, the risk have been proven that they are certainly worth the rewards. Consider taking the risk you will be amazed on the returns. In the end its is a personal choice, and there is no correct answer. Your life is your own, and your case, life is certainly great now. you have done really really well at such a young age. You could certainly enjoy a good one on the track you are on, but it could be even more fulfilling with the addition of your own family to share your success and excellent skills with. MI 105 is prudent think think about her and her husband’s personalities, interest in raising kids and potential outcomes. We started having kids at about MI 105’s age and ended up with one typical and one special needs kids that will need lifelong care (and probably live with us … adult group homes feel so depressing). Kids, especially special needs kid will strain a marriage and put big wrinkles in career/financial plans. My wife totally stalled her career for our kids. I had the same mindset about the low odds of needing to be atypical parents but it can happen. We have no regrets or resentment ourselves but MI 105 is prudent to think through the scenarios before making such life changing decisions. Interesting perspective. First off, great job increasing your NW and multiplying the blessings you started with. You should definitely feel proud of your accomplishments. Reading your interview, I agree with MI-94: there are a lot of comments regarding divorce which raise concerns. It reads exactly like a business deal from my perspective and you have thought through a lot of contingency. I’m not saying do not be prepared to live on your own but this reads to the extreme and as if you married to increase NW, not love. I watched my mom struggle with divorce and figuring out life as a single parent and my grandmother was windowed with a young child as well so I applaud your independent mindset as I believe women should be strong and able to lead the family. I have this conversation with my wife a lot. While my wife and I do want kids, to each their own and it isn’t for everyone. But, I read your comment regarding the risks and work vs. uncertain reward and think: how is this different than the business aspect of your life? You allude to family and the importance, but hold back because of risk while the other aspects of your life are full of risk and reward. Maybe just a question for you and your spouse to think through as you make your decision. Either way, best of luck and thanks for sharing! MI-105 and my wife think a lot alike. I didn’t know it at the time, but prior to getting engaged, my wife was making a similar assessment. I was something of a financial disaster in my 20’s, loaded up with student loans, credit card debt, and uncontrolled spending, etc… you get the picture. She was the exact opposite – frugal and very aware of the value of each dime. In her words, unless I had shown some sign that I could listen to her, let her manage my paycheck, and alter my behavior, there wasn’t going to be any marriage, regardless of love. My point is that I believe MI-105 is giving us insight into the thought processes that some people rarely express or admit to, perhaps out of concern that it will appear too calculating. Were I (heaven forbid) in the situation of considering a potential mate right now, given my NW, I would go through all those questions…. do we need a prenup, what happens in a divorce, how do i shelter enough of my assets to feel I am covered for the worse case, how are we going to join families, what is our estate plan going to look like, are we financially compatible, etc. And on the +/- question of children, I believe more women should weigh the considerations as she has. I know more than enough people who should not have had children, for everyone’s sake. I understand the societal pressure to have children, people don’t mean to be pushy, they want you to share in the experience of childrearing they had, and they simply cannot fathom a full life without children. But for some people, having children is viewed as a choice, not an imperative, and clearly MI-105, as are my wife and I, among them. Something about this interview didn’t resonate with me as much as other ESI profiles. At first, I was surprised by their level of wealth at such an early age – but they make a very good living and live in a low cost area of the country. So far, so good. However, when you look at all the economic outpatient care she was given early on, that somehow takes a little of the “oomph” out of their story. I still commend them both, but to get almost half-million dollars in your 20’s? that’s like starting off on 3rd base when everyone else is just stepping out of the dugout. Kay, I get your point and love your analogy in your last sentence. However, the takeaway for me in this story is someone who had an early advantage and didn’t squander it. We all know a lot of immature adults who would have taken such a great start and then blown it, only to have to start over with virtually nothing. 105, did you have a blog in the past? Your story remands me so much of this blog I used to read. The blog shut down when the author got married but before that she was into RE investing. I loved that blog cause I was also a young, female RE investor. She was from the south, had a couple of section 8 tenants , came from a family with means and had a bunch of sisters. She also had an Audi! I used to love that blog and was so disappointed when it shut down but hey, life happens. If you are that girl, so great to hear of your continued success…If you aren’t that girl, well same still applies, great story, keep at it. I was thinking exact same thing… I remember that blog. I imagine she shut it down to focus on other things, and also probably started getting hate mail owing to her circumstances. Its like fast-forward and now our young blogster is all grown up! Yes, that’s me! I miss that blog too. I eventually regretted shutting it down, but my husband wasn’t as comfortable with my oversharing (and my anonymity was weak). Plus I had fewer rental dramas once I hired a property manager. I started another one a few years later in my real name, but the internet has changed and it was hard to be as opinionated or open – though I never really dealt with hate mail because of my circumstances. I had to shut that one down too when I got my most recent job due to compliance. But, you know, I think if I had been given as much money at the same age, I do not believe I would have been able to handle it responsibly. In fact I know I would not have – and dear wife laughed and confirmed as much when I told her about MI-105’s story. The success 105 has demonstrated goes well beyond the “big head start”. It’s about managed risk-taking, learning from mistakes, discipline, focus, continual education, being willing to get your hands dirty, wise decision-making, etc. The learned behaviors and attitude with respect to money are just as much an inheritance as the money itself. And the big safety net allowed her to make mistakes without dire consequences, but at least she learned from those mistakes. As I noted earlier, being born on 3rd base clearly has its advantages and MI-105 clearly optimized those advantages. By contrast, I started with less than zero wealth… i.e. a whole lot of student loans and no financial help from family as an adult – and from time to time I would need to help my family financially well before I could “afford” to like borrowing money to lend money to a family member. Early on, I was not even in the stadium parking lot, much less the dugout. But, the winding path that I had to take, including the stress, pain, fear, frustration, mistakes, humiliations, etc. were all part of the education I needed to eventually figure my life out, find the right partner, climb over the stadium wall, and hit the ball out of the park. And my path leaves me with no doubt or guilt about my own success. That said, it does not invalidate 105’s path. The beauty of all this is that there is more than one way attain wealth and prosperity. So, while in theory I’m completely envious of 105’s head start, in my heart of hearts, I know I had to do it my way. I do not begrudge 105 her big head start. She seems appropriately aware of the advantages she was given and I really appreciate her willingness to show all her cards. Too often in the personal finance media, truly relevant details like gifts and inheritance, are skipped over so you have no real idea how people got to where they got to. It’s treated as an after-thought, and swept under the rug. I find that it is human nature to completely discount the impact that parental and family “welfare” has on financial success. Studies have show that even a small amount goes a long ways and I’m guessing just about all of the millionaires in the study have received some of it to a varying degree. What makes this millionaire interview series so totally awesome is the level of disclosure! What a great story. And yes we all have different paths to walk. My siblings and cousins all had more or less the exact financial advantages that I did, and we are all living very different lives. My husband started out with no financial advantage at all; his parents didn’t even have college degrees, though they both had good union jobs and made ends meet and retired with pensions. He does have the advantage of being a tall white male from a loving home – no small thing – but he graduated from college with a liberal arts degree and $20K or so in debt. He worked, went back to get his MBA (for which he borrowed $90k), and was just getting a foothold in the corporate world when we met. He’d managed to save up about $200K by then and had broken into a 6 figure income – and had shaved his student loans down to $60K. He was 5 years older, and my net worth was over $900k by then, but I was much more impressed with his financial situation given where he started and the lack of direction or pushing to succeed he’d gotten from his parents. It doesn’t surprise me one bit that his income has continued to soar and well exceeds mine now; his drive to prove himself and his work ethic are simply stronger than mine. Which ironically is probably due at least in part to the cushion I have always had. I agree with Miguel and Paper Tiger…kudos on using your foundation to enhance your wealth. This reminds me of recent comments on MI-103 (I think) and if you should provide financial assistance to family / friends. I wouldn’t be surprised if there’s some resentment in your success. 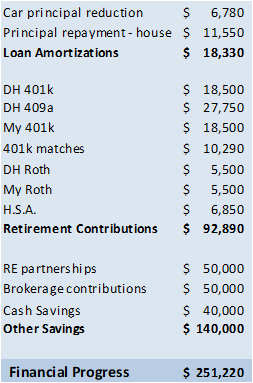 How are your Roth IRAs allocated (amount, investment type) between you and your husband? And how old were you when you first contributed? My Roth IRA hovers just over $200K and is 100% in the Vanguard small cap index. His is about $50K and is in a combo of some individual oil and gas stocks as well as a vanguard international index (the market has declined since I wrote this post). I started my Roth IRA at age 18 when I was a freshman in college and have maxed it out since I was 20 or 21 (the max was lower then, but I’ve met it each year). John – Another amazing interview in the books. I enjoyed reading your post too, and commend you for all you have done with both focus and sensibility. I would like offer an alternative viewpoint to charitable giving to your comment, “Our situation has changed, but we have some misgivings about how best to allocate funds and whether many charities use resources well or make much of a difference at the end of the day.”. There are many high performing, social impact organizations. I personally don’t like the word charity. Today’s social sector challenges require investment. Many of us who work in the field and with children in poverty understand the power of higher education as a ripple effect towards economic empowerment. The ROI is a new and higher trajectory of their lives, our community, and our world. I am considered a social innovator. I would encourage you to consider a donor-advised fund through your local community foundation, Vanguard or Fidelity. You can put in funds each year and distribute them as you want throughout the year. There are some tax reasons too. The community foundation can also advise you on your areas of interest and connect you to those organizations and leaders. “Much is given, much is expected.” I have talked to many major donors who have told me that as much as they have given to social impact organizations, they have received 10-fold in their own wealth building and by leading a purpose-driven life by making a difference. I hope this encourages you to think through your life as a philanthropic investor. I think your idea about retirement is more in line with mine. When I first mentioned FIRE to my wife, she thought I meant stop working. I meant doing what I want, which is still working, but not necessarily my current position. At the moment I have no desire to stop programming, but I could see myself taking my talents to school and such places if I could live off my investments. That all being said, your experience is a great success story. I hope others find it motivating. What a surprise….all I can say is WOW! Or World of Wealth. Thanks for the update on your fantastic success and marriage. Great interview.